Everybody who has taken a course in electromagnetism knows that the voltage induced in a loop is the integral over the contained surface of the time derivative of the magnetic field. This is Faraday's law and was known when Maxwell was a student. 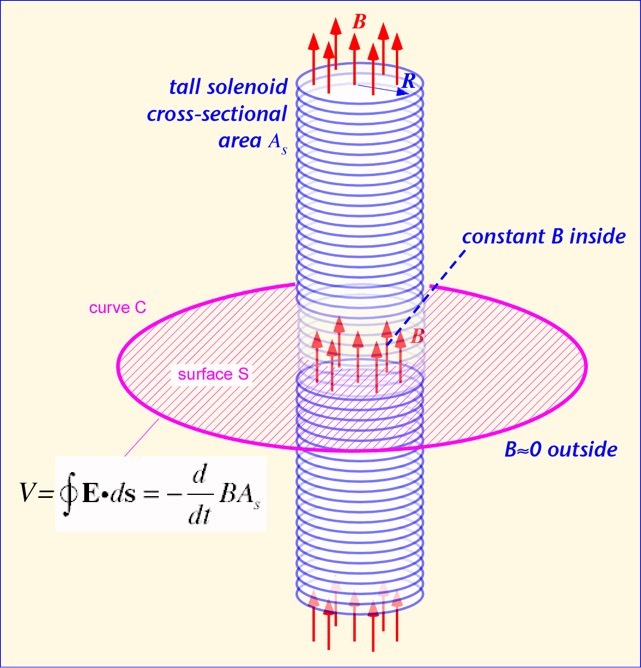 where B is the (roughly constant) magnetic field inside the solenoid and A the cross-sectional area of the solenoid. If the current in the solenoid is changed (slowly, so that the reactance of the solenoid is not a problem), a voltage is induced in an external coil following curve C. This is all uncontroversial, of course. But here's the interesting part: where does the voltage come from? The magnetic field we are integrating over is a couple of solenoid diameters away from the electrons in the outer coil; they have no way of knowing that it is there. 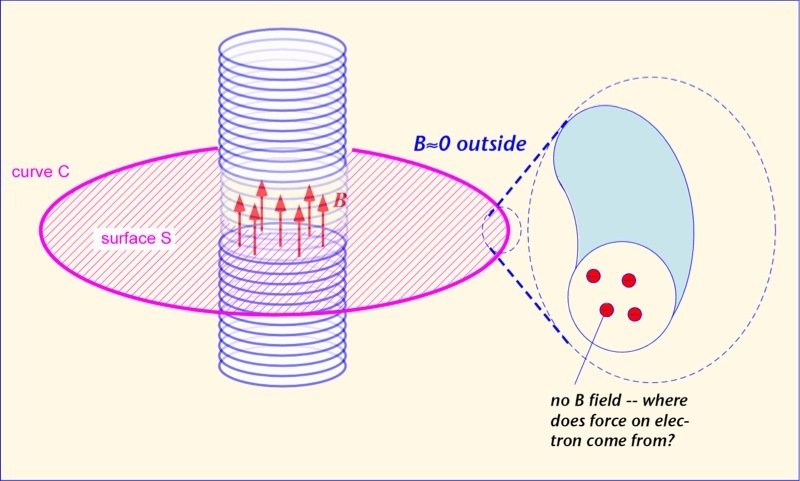 Unless we wish to invoke action at a distance, which is usually avoided in modern field theory, we need to have a local quantity that affects the electron motion in the external coil. The answer, of course, is that the voltage is the result not of the magnetic field, but of the vector potential A. Outside the solenoid, the vector potential has only an azimuthal constituent, and falls in magnitude as the inverse of the distance. It is easy to verify that the function (1/r) has no curl away from r=0, so B is zero -- but A is not! It's also easy to see that the integral of (1/r) around a circular arc of radius r is constant -- (1/r) * r = 1 -- irrespective of the radius; that is, the integral of the vector potential around the loop is independent of the radius of the loop, so long as it is outside the solenoid, just as predicted by Faraday's law. It is the vector potential that pushes the electrons in the wire around, even in locations where the magnetic field vanishes. There is no need to calculate the magnetic field at all; just find A at the location of the loop, and take its time derivative in the direction of the loop of wire. Note that, although finding the exact value of the vector potential might be a bit subtle, the relationship of forces and sources is very simple. 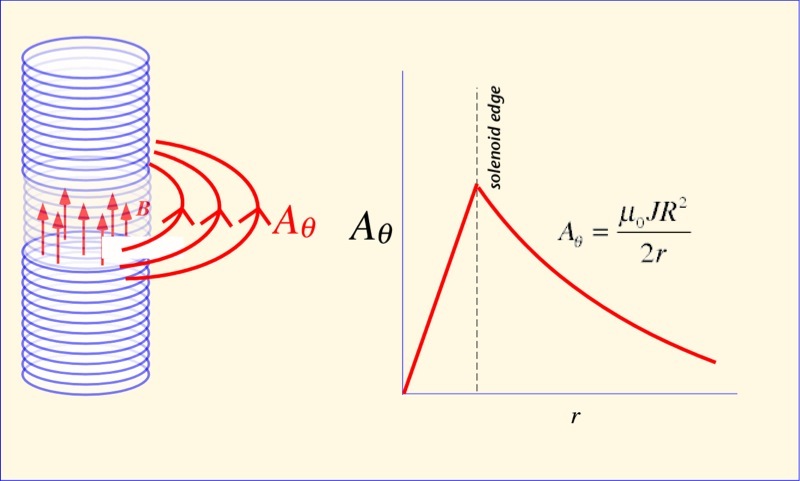 The vector potential arises from the current on the solenoid and goes in the direction the current goes. The resulting electric field arises from the time derivative of the vector potential, and points in the same direction (and thus along the outer loop of wire). There are no cross-products or curls to take. One electron acts on another, and that's all you need to know. Like Poe's Purloined Letter, A has been hiding in plain sight. Now that our eyes are opened, let's see where we can apply this new viewpoint to familiar problems. "Surprisingly, it is not easy to find an expression for the inductance of a straight piece of wire, and it is far more difficult to find out how that expression was obtained". Set up the geometry of a point at some distance from a straight line. Write dH from Biot Savart at that point. Let the current equal one for simplicity. Find the total H due to all of the current in the line by integrating over the line. Set B = μ H.
Find the magnetic flux phi in a differential area which is parallel to the wire by integrating B over this area which is a fixed distance from the wire. Find the total flux phi over all of the area from the edge of the wire to infinity by integrating over the distance from the wire to infinity. Since the current was set equal to one, the total flux equals the inductance. We'll do something much simpler. A comes from current I. We integrate the source equation over the (constant) current to get A (which is in the z-direction if the wire is along the z-axis -- no cross-products!). We can get a pretty danged good guess at the inductance by simply multiplying -dA/dt by the length of the wire, but for the picky folks we'll go farther and integrate the expression over the wire length. Everything happens along the axis of the wire. We don't care what goes on at infinite distance, and don't need to find the flux. Enough talk, let's see how it's done. To write out the integral we need to decide on a coordinate system and names for the dimensions of the wire. These are shown below. We'll assume the wire is along the z axis and place z=0 at the center of the wire. 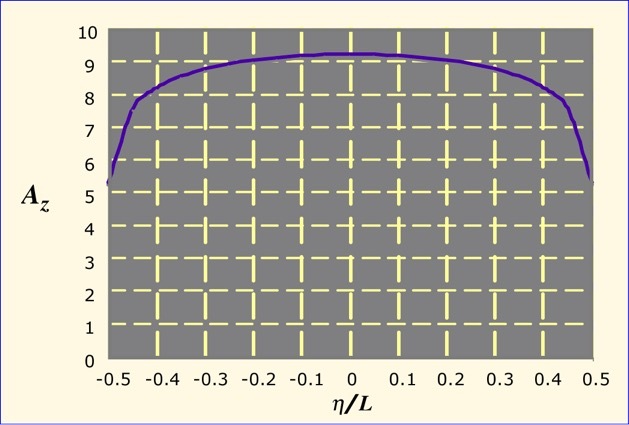 In these terms, the approximation above is valid when the wire length L is much smaller than the wavelength at the frequency of interest (which is, of course, c/f where c is the speed of light and f the frequency). Though we won't prove it here, for reasonably thick wires and high frequencies, the current is mostly at the surface of the wire, so all the current elements are the same distance from the wire axis. As long as we take the integral along the axis of the wire, we don't have to worry about the current density: we can just integrate over the perimeter of the wire to find the total current at each location z. So we got a reasonably good answer with one finite integral. Furthermore, the intuitive meaning of the answer is straightforward -- the inductance is proportional to the wire length and to a term that expresses how close the currents are to the center of the wire -- and it's easy to modify the approximation for shorter wires (where a is not negligible): we just use the radical expression instead of approximating it by L.
A plot of Az along the length of the wire (for a ratio of L/a=100) is shown below. It's easy to see that the potential is almost constant along the wire except very near the ends (where we really ought to be taking account of currents flowing on whatever connects to the wire). 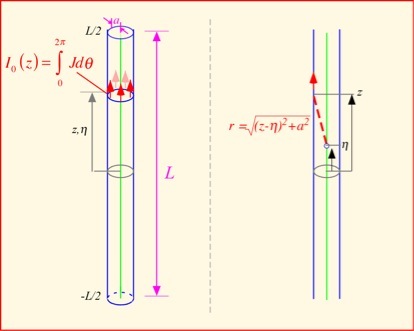 As long as the wire length is large compared to the radius, we have likely made only a modest error by our single-point integration. That's a lot of labor for a tiny improvement! 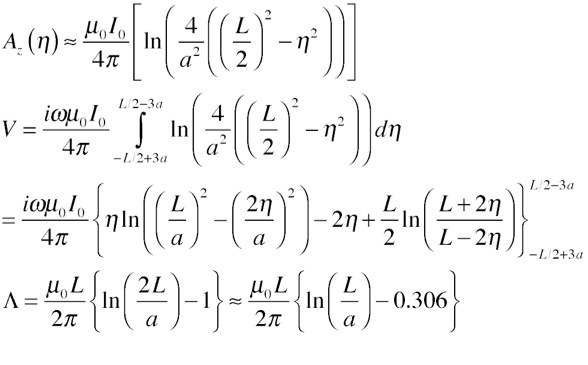 For reasonably large values of (L/a) the single-point integration is quite sufficient. When we use the right approach simple questions are simply answered. It's a bit more complicated to apply our methods to a loop, simply because the relationship between the location along the loop and the distance to a test point is more complex. A complete analytic solution requires hypergeometric functions (raise your hand if you've never heard of them -- you'll be in good company). In today's world I would argue that expressions in terms of sufficiently obscure functions are not particularly better than numerical integration. We want something we can work with. This estimate is quite accurate as long as the ratio R/a >> 1, and much more convenient to use than hypergeometric functions or elliptic integrals. Furthermore, it's apparent that we can partition the inductance of this structure (and plausibly of any loop) into two rather distinct parts: a portion from the wire nearby that looks almost like a straight wire contribution, and a portion from the distant "return" part of the loop that depends only on geometry and not on the dimensions of the wire. It's a lot of trouble to go through for not much numerical benefit (though in this case we don't need to pull a guess for an equivalent size of the square coil out of the air, which is admittedly cheating). 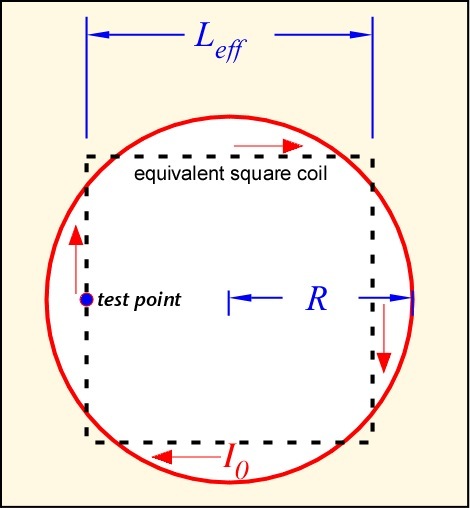 Once again, we find that a good approximation to the full answer can be obtained from a very simple procedure, which also shows explicitly the contributions to the inductance from the radius of the wire and from its overall shape. Hopefully you'll agree that for some common geometries, we really don't need to care about the curl of the potential when we can use the potential itself. In the next section we'll look at the simplest case in which time and wavelength are fundamental, the transmission line.